Is there anything better on cold and wet winter days than homemade soup? It is cold, windy and rainy and The Artist has another sinus infection. There is only one answer for dinner … homemade soup! Especially since this is the end of the Mayan calendar and we may not be here next year, LOL! This is a super easy recipe that anyone can make and it puts any canned soup to shame. Apply a few of my hints and you will be looking for excuses to make your own homemade soup all year long! Soup is one of the world’s oldest meals, designed to take advantage of all the bits and pieces that aren’t quite enough to make a meal on their own. You can make them vegetarian, vegan, or go all out with any choice of meats. This time I made ours with beef and vegetables. A couple of months ago I went in to my local butcher and asked him to cut up some beef bones for me. He hauled out a huge bone and broke it down into pieces about 7-inches long. I brought them home and froze them for future meals. Yesterday I defrosted the first batch. The secret to the best soups is to roast (on the stovetop or in the oven) the bones, bringing out their fullest flavor and infusing your soup with pure essence. As with any foods, roasting adds tremendous flavor and is incredibly simple. You start by cooking over high heat, then lower it and walk away, leaving the bones and vegetables to cook until deeply browned. Then add liquid which dissolves all the browned bits in the pot, and suddenly you have stock. Your stock is then ready to use in a myriad of ways. If you don’t have the time to let the bones roast as long as recommended, you can also utilize a high-quality base to boost the flavor. Beware of cheap bouillon cubes and granules because they tend to be very high in sodium and leave you with an overly salty stock. Superior Touch makes good quality products called “Better Than Bouillon” that are available in most major grocery store chains. If you have celiac disease, you may have to avoid this due to the soy. The second half of the process is to make soup from the stock, and again, it is so simple. If you have the time, chill the stock so that the fat rises to the top and solidifies. You can then easily separate it from the stock and either discard it or use for another purpose. I hate to waste all that delicious flavor, so I always find ways to use it! As a matter of fact, because I do not cook my vegetables in the broth (I know, heresy abounds in my kitchen! ), I use a little of it to sauté my vegetables before adding them to the soup. The vegetables retain their flavors, don’t become overcooked and soggy, and the beef fat intensifies the beef flavor of the soup. Fresh vegetables sauteing in a little of the beef fat – so good! When the world is freezing outside and you want to feel cozy and warm, make this soup for your friends and family. Put the bones on to cook in the morning and you will have plenty of healthy, freshly made stock to use for soup that afternoon or freeze it for future meals. This way you will have many comforting meals for the coming months ready to go in your freezer! Soup is the best way to utilize all the vegetables in your refrigerator that you haven’t gotten around to using. 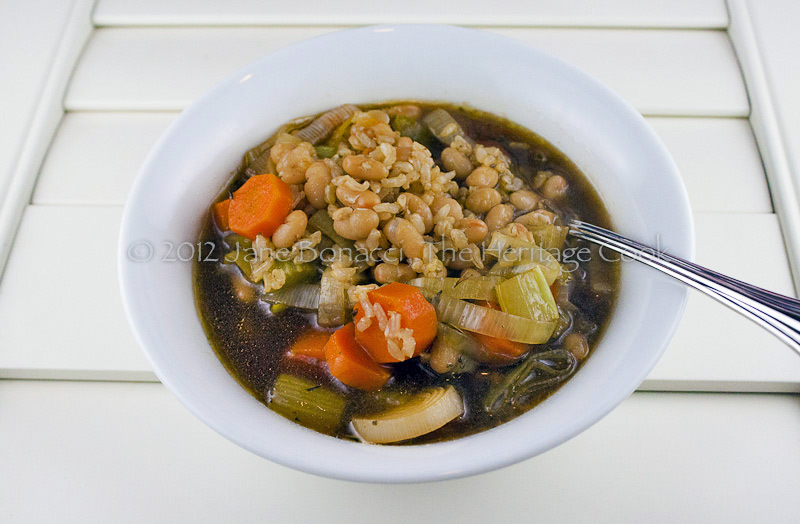 There is almost nothing that doesn’t taste better when simmered together in a flavorful broth! If you buy fresh bones from the butcher, there is no gluten to worry about. Choose rice, potatoes, or beans to thicken the soup to your liking. Before you start cooking your stock or soup, measure out 1 quart of water and add it to your cooking stockpot or Dutch oven. Using the handle of a wooden spoon, dip it straight down into the water and mark the level of the water on the handle. I use a piece of tape, but you can also make a mark with a pencil. Discard the water and set the marked spoon aside. Prepare your stock in the same pot and cook your liquid down as directed. Use a second wooden spoon to measure the depth of the liquid in the same pot and measure this against the wooden spoon you marked earlier. This will quickly tell you when the liquid had reduced sufficiently. By © 2012 Jane Bonacci, The Heritage Cook. All rights reserved. Unauthorized use, distribution, and/or duplication of proprietary material on The Heritage Cook without prior approval is prohibited. If you have any questions or would like permission, I can be contacted via email: theheritagecook (at) comcast (dot) net. Feel free to quote me, just give credit where credit is due, link to the recipe, and please send people to my website, www.theheritagecook.com. The intention of the content on this site is for your inspiration and enjoyment. It is not a substitute for advice given by a licensed health-care professional. You are responsible for medically confirming any dietary restrictions and ingredient safety with product manufacturers before consuming or using any product. If you have dietary restrictions, always read the labels before including any ingredient in your cooking. As an affiliate member, if you click on links in my posts and purchase a product, I may receive a small percentage of the sale. Any commissions received will be used to offset a portion of the costs of running The Heritage Cook. If I have received products for review or had travel expenses covered, I will disclose that in the content of each article where applicable. What is your favorite soup to make from scratch? Great tips on making wonderful soup. I’m going to have to remember to get bones from the butcher. Thanks Barbara. Besides getting unbelievably deep, rich flavor, your house will smell absolutely wonderful, like you are roasting a prime rib roast!